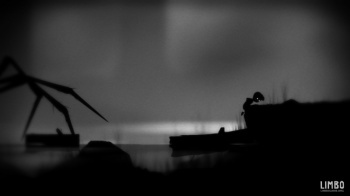 Acclaimed Xbox 360 indie horror-platformer Limbo will be hitting PS3 and PC in a matter of weeks. Last summer's Xbox Live Arcade title Limbo was a haunting, bleak adventure that we absolutely loved. While there were no plans to bring the title to other platforms at the time, the Korean ratings board accidentally leaked a rating for a PS3 version of the game last week. Developer Playdead has confirmed that Limbo will at long last be coming to non-Xbox platforms, so that PC and PS3 owners can discover terrifying new heights of arachnophobia together. According to the official site, Limbo will be hitting PSN on July 19th and July 20th for North America and Europe, respectively. PC owners have a slightly longer wait ahead of them, and will be able to pick Limbo up via steam on August 2nd. This is really great news, honestly. Limbo was a magnificent experience that showed just how genuinely atmospheric a game could be even when played on the comfort of your living room couch. If more gamers get to play it, so much the better. Playdead also announced that the Limbo soundtrack will be available via iTunes on Monday, July 11th. You know, in case you're not creeped out enough by the time you exit out of the game.